She started walking today and my mama heart can't even handle it. I'm so excited... seriously overwhelmed with joy. But at the same time I'm thinking... now that she is mobile we're really in for it. Haha. Seriously though, she isn't scared of anything anymore, especially now that she's conquered walking and she's able to communicate better. But when we walk through the spooky Halloween aisles in stores she doesn't even bat an eye... she even points, giggles, and talks to the creatures for sale. She's definitely NOT a scaredy cat. With that knowledge, it probably comes as no surprise that we're all pretty big fans of Halloween in our house... Like really big fans! So we decided instead of just celebrating the creative, costume-filled holiday ONE day, we're going to celebrate all 31 days of October and since she's growing so much and learning something new everyday, it'll be fun to document it all here too. So go ahead and follow us on social media and sign up for our newsletter so you don't miss any of the Halloween fun! We're going to be sharing 31 fun Halloween posts, one each day this month! 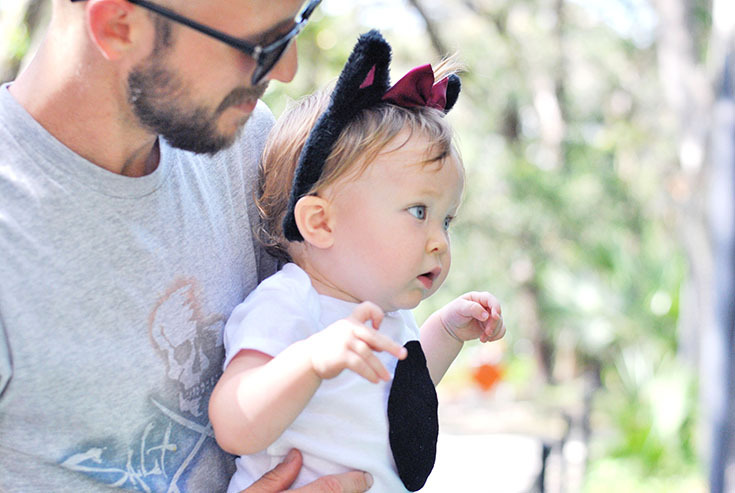 From DIY costumes to fun crafts to do with toddlers, I'm so stoked to share all the spooktacular posts with you! 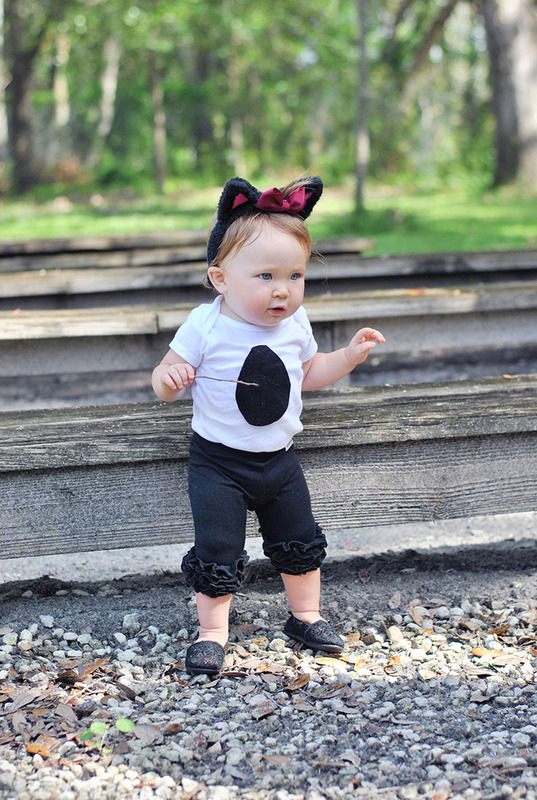 Today we're starting out with a super simple and sweet sassy kitty cat costume! All we did was throw on a white onesie after snack time. 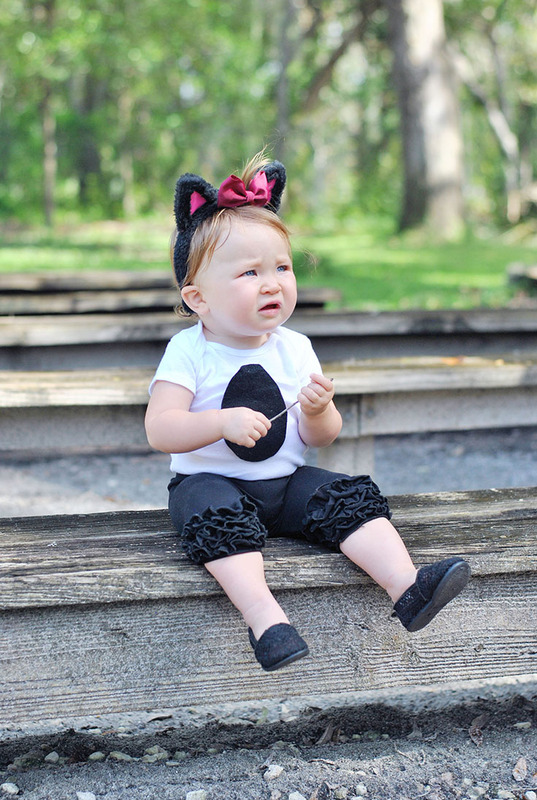 Then simply taped a felt "fuzzy belly" patch on her, added a pair of black Sew Sassy Capris, paired with her lace black flats, and then added the finishing touches for this sassy cat - the kitty ears from Target and the sweet little fall bow from Darling Diva Boutique Bows!